Landing page performance, conversion rate, bounce rate, goal completions - the list of engagement metrics goes on. 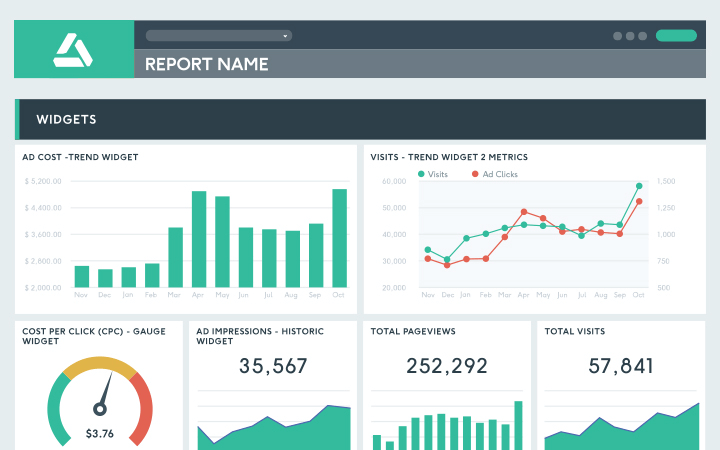 DashThis will let you present your client's website metrics in custom google analytics reports for marketing agencies. Don't spend time pulling together stats into an Excel sheet to show your clients. Let our tool pull your numbers and do your Google Analytics data visualization instead. We've got preset templates you can use to get started and best of all you can integrate your other data sources, including Google Search Console, AdWords, Ahrefs, Moz, SEMRush and more! Our system does the data-fetching for you, which gives you the time to create custom reports full of valuable insights for your clients. You can even send out the reports automatically. You're already on top of the KPIs you need to track for your clients' websites: organic search position, bounce rate, traffic sources, exit rate, session duration, and more. DashThis lets you concentrate on the metrics that matter in your clients' digital marketing campaigns. Stay on top of them using our preset widgets or you can create your own. Create custom reports for your clients' sites: you can add logos, comments, merge data into a single widget and easily create unique reports for each of your clients. You can start with a template report and customize it or build one from the ground up. After all, it's your client's data - show it how they want. You're probably doing more than just search engine optimization and Google AdWords for your clients. We support all the major SEO, web analytics, and digital marketing (PPC and social media) tools. Once you've integrated your reporting tools, we do the data-fetching and data visualization for you. Want to input some custom data? No problem! Just set up some CSV files and import them. Give your clients the complete picture of your digital marketing efforts in one single dashboard. DashThis is a perfect solution for marketing agencies: we make it quick and easy to track and report on your clients' digital marketing campaigns. But don't just take our word for it. That's what these marketing agencies - and many others - have done. With all their spare time, they're doing more of what they do best: creating killer marketing campaigns for their clients. Digital marketing reporting doesn't need to be complicated. DashThis' digital marketing reporting tool is simple to use and comprehensive enough to let you report on everything your clients will want to know about their marketing campaigns. But we're always here to help if you need it - just contact your dedicated account manager. Whether you're a large agency or a one person show, we've got a plan for you. And best of all, using DashThis for your client reporting can actually save you money: you'll spend less time on creating reports which means you'll have more time to spend on paying projects. Sounds like a win-win to us. We've created a template you can use to get started that includes the main Google Analytics KPIs, including organic traffic, goal conversion rate, return traffic, page views, and bounce rate. You can start with our template (or you can build your own report template).